How do you say it in Korean? Jeopardy and Museum Role-Play Lesson! Free Downloads! 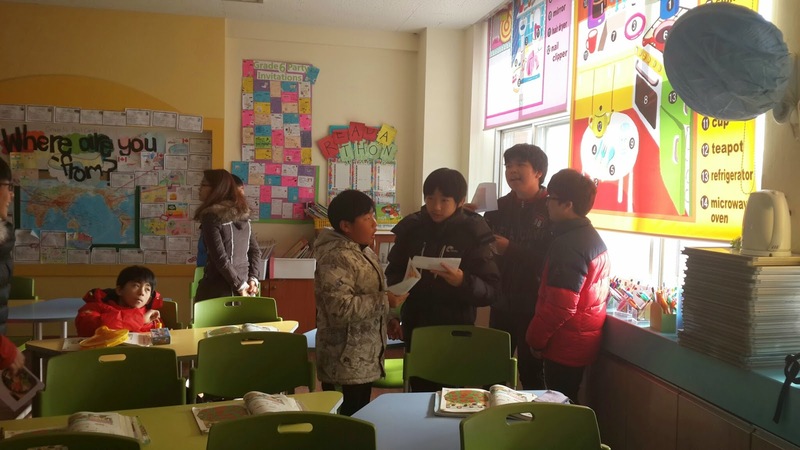 My grade 6 classes are currently studying the lesson "How do you say it in Korean?" It's all about how to talk to foreigners about Korean things, traditions and culture. 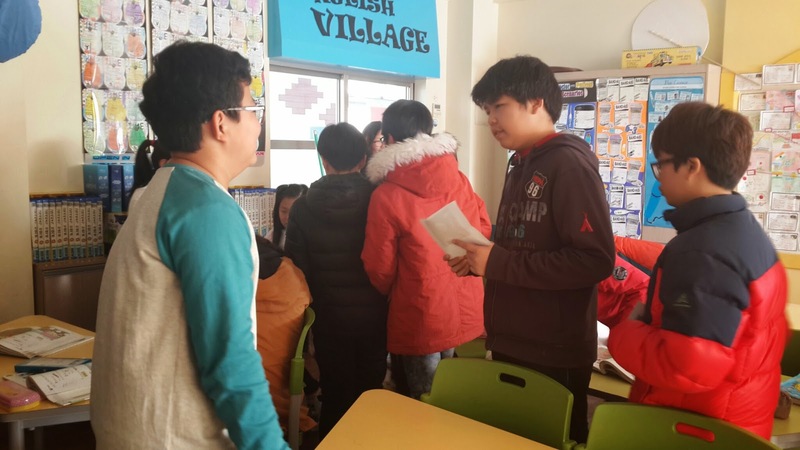 It actually a very easy lesson as the students know most of the phrases as we use them all year round - especially the "How do you say it in Korean/English?" question. I played this video before our game and asked "What is K-POP?" and the class had to "tell me about it" - It's Korean pop music. For my first lesson I did the classic Jeopardy game - which they loved. They're just screen shots - you should really take a look through the PPT. I have some questions that require video - e.g. for the 50 point Food question it links to a video of a man making the Canadian food 'poutine'. I get the students to watch the video first then I ask the question (I also skip through the video a couple of times). SO please, have a look through and contact me for any questions. 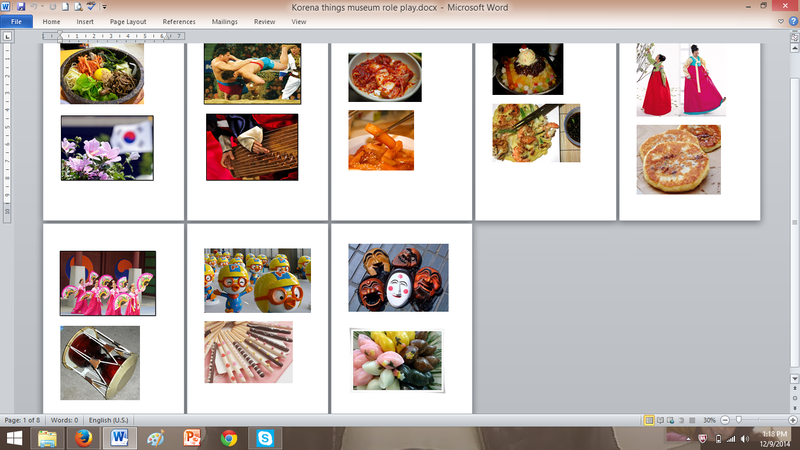 For the next lesson it was all about Korean things and role-playing the conversation. I first showed this video to get them warmed up. Note: the swearing is bleeped out, although my students didn't catch it anyway because they talk so fast. This was a good video to warm up the class for the role play about Korean things , after watching I asked "what is sannjaki?" , "can you tell me about it?" etc. It was interesting for them to watch other odd foods from other Asian countries too and more importantly, learn that every country has odd foods and not all people like the same things... as many Koreans are subject to believe that everyone MUST love Korean food - which is not the case! We all have our own tastes! 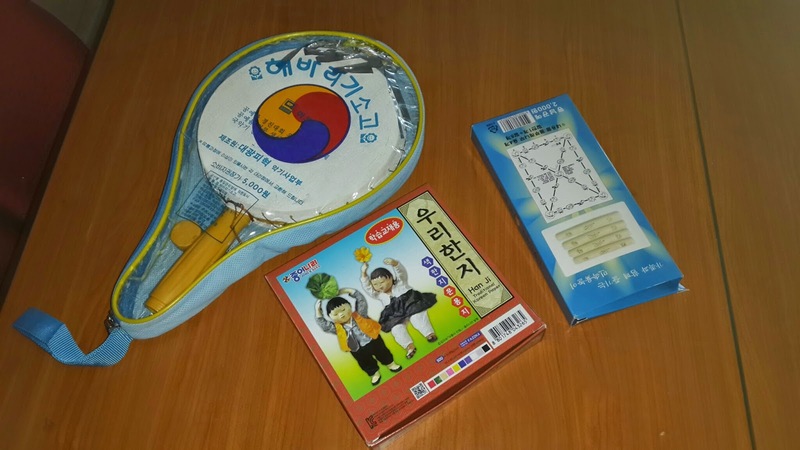 Hanji Paper , Korean drum and a Yunnori game... I also found ginseng tea. These were just demo props I wanted to use. I started the lesson by asking the students "What's this?" while holding up one of the above props, then they would tell me "Hanji Paper!" and I would ask "Can you tell me about it?" Then they would attempt to tell me. 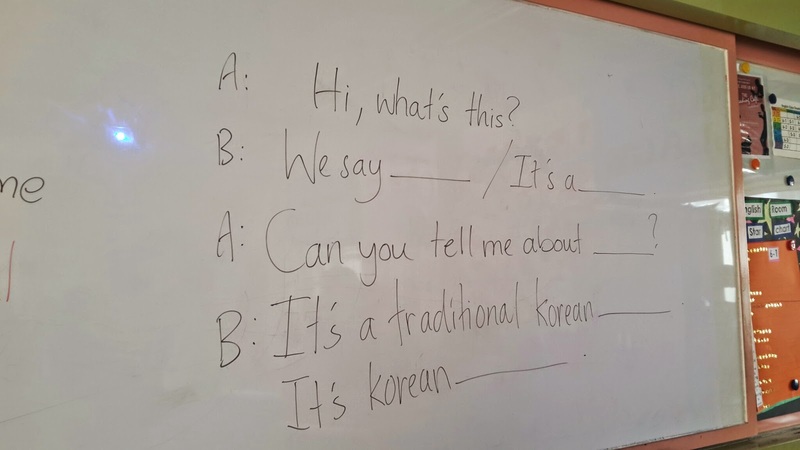 In the textbook they use the dialogue "It's traditional Korean ___________" or "It's a traditional Korean ________" so I had this up on the board for them to try and make the correct sentence - e.g. "Hanji Paper is traditional Korean paper. We make things with it." Of course, certain items are easier than others - which is all part of the learning challenge. 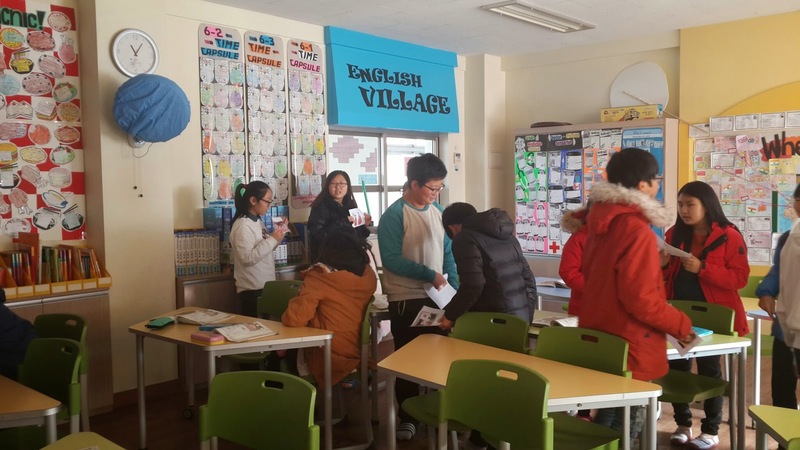 After we went through all the items I then gave each student a picture and told them they had to go around and act out a role play with their classmates, as if they were at a museum and they were either the guide or the visitor. (take turns, swapping roles). They did really well going around the class and acting it out. I heard plenty of English. Next, I asked them to come up and present. I did it by randomly drawing names from a hat (a.k.a my head). It went really well! This lesson went really well. For our project we're going to do Show and Tell. I am still planning on what to bring for my show and tell item. Every student will have to bring something from home to talk about, we will assign this during next lesson. I really enjoy reading your blog... it has helped me a few times when I couldn't figure out how to get the students motivated. The Jeopardy game looks great, but I had to change the animations so that the box will disappear when I click on it. I plan on writing a blog post on one of your other ideas I used (and of course giving you props). Hey that's great, just link it back to my blog. I'd love to see what you do. Ah yes, the boxes don't go away, but my kids just told me what had already been done. Sorry, forgot to add that...not sure I know how.